On Friday I had the good fortune to tour the traveling exhibit, “Hapsburg Splendor: Masterpiece s from Vienna’s Imperial Collections, at the High Museum of Art in Atlanta from Oct.18-Jan. 17. After viewing several galleries of wonderful paintings and objects, I entered the next room and was stunned when I came upon this incredible painting, attributed to the great Caravaggio (though not without some dispute). For several months, I’ve been using an iPhone app called Mysteries of the Holy Rosary, which incorporates high quality Baroque art into each decade. As you know, I’m all about visual aids to contemplation and I highly recommend this app! 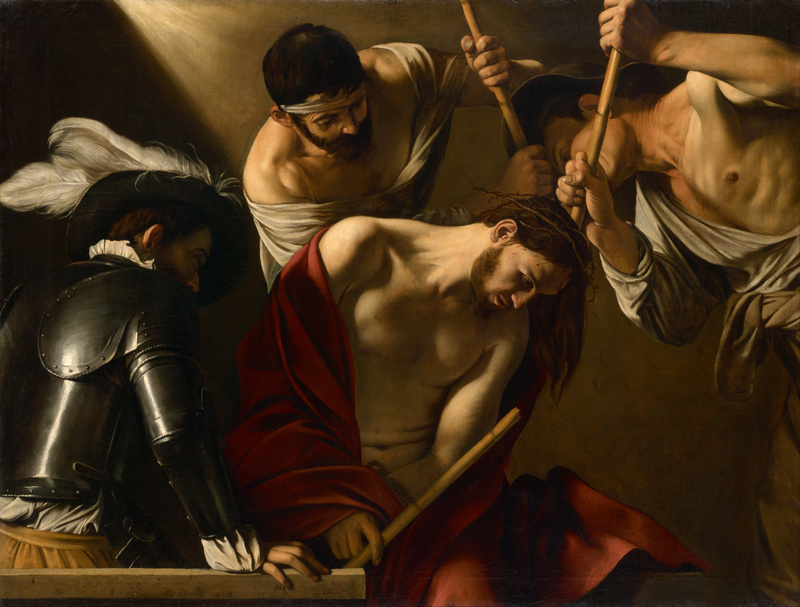 This painting is used for contemplating the Sorrowful Mystery of Christ’s suffering with the crowning of thorns. Having never been to Vienna, I had not seen this work in person, only within the tiny confines of my iPhone screen. So when I turned the corner and came face to face with it, I was literally so stunned that I cried out, “Oh…oh…oh”! I’m sure the security guard thought I was a little strange. As I gazed on this image of our Lord in his suffering, I was completely overwhelmed. I felt the same grief and joy as I did when I first turned my life over to Christ in adulthood and came fully into the Church. On that occasion it was a Spanish Baroque crucifix in the California San Luis Rey Mission that evoked these complex feelings of pathos and gratitude, with the overwhelming thought, “You did THAT for ME?! ?” Seeing this painting recaptured that same incredible grace. If you live near Atlanta, get yourself to the High Museum ASAP to view this masterpiece. It’s worth the price of admission. This entry was posted in Art, Bible and tagged art history, Caravaggio, chiaroscuro, Christian, Hapsburg Splendors, High Museum of Art, Jesus, Suffering servant.